Skip the big-box stores this year. Support locally owned and operated shops in Ballard’s West Woodland neighborhood! With so many talented makers, there’s no excuse for shopping chain stores for gifts. Whether you’re looking for handmade, custom, or personalized, you’re sure to find the right gift here in the neighborhood. When you shop local you are sharing something unique and meaningful with those on your gift-giving list. See your favorite West Woodland gift missing? Comment below or email us at westwoodlandneighbors@gmail.com. Happy Shopping! Come for the shoes, stay for the socks. The Sneakery has your feet covered with hard to find brands and unique designs. Looking for those PF Flyer high tops you wore as a teenager? The Sneakery carries those as well as other brands. Locally owned & operated, fill those Christmas stockings. Everyone loves socks! Hours & more on Facebook. West Woodland’s newest small business, Hapertas & Company, will help you look your best at every event. Classic menswear made with the finest Pendleton wool will elevate your style! Buy your favorite guy a bowtie. Meet Jill Evans, owner, designer, & maker, during the Studioworks Ballard Shop Small event on Saturday, November 25. Event information HERE. The Frit jewelry is beautiful. Hand blended, packed crushed glass (frit) fired to melting temperature to fuse the particles together. Available as earrings, brooches, necklaces, and rings. Each item is designed and produced in the studio. Stuff my stocking! Chocolat Vitale has an amazing section of French, Italian, and hard to find wines. Not sure what pairs well with your Christmas ham? Janet and Carol are happy to help you find the right bottle, with a fine selection in the $12 – $20 range. Besides wine, Chocolat Vitale handcrafts their own drinking chocolate, caramels, marzipan, and more. Since 1994 Blowing Sands has been a part of the Ballard arts community. The gallery and glass blowing studio offer Northwest artisans’ craftwork and a chance to see glass blowers at work in the hotshop. Don’t miss out on the brightly colored glass ornaments, in hues of blue, red, gold, and more. A uniquely sculpted gift to be enjoyed year round. Purchase in-person or on Amazon. Simple design delivered monthly. The Miroja Boxed monthly subscription is for the person that loves simple + natural design. Each surprise box – small, medium, and large sizes – contains a plant or plant accessories, and home goods all with a focus on simple design. As the temperature drops, you’ll want to wrap yourself in an A to Z hand-colored, antique-washed scarf. Selling for $15 each, the scarf is lightweight and perfect for layering. Each one is about 6 feet long and made with 100% Turkish cotton. While you’re there, don’t miss out on their ultra-soft long sleeved modal tops, just $25. Can’t make it in? No problem, shop online HERE. Ballardites love boats & aquavits! Give both with this Viking Ship 6 Pack Assortment. All six of Old Ballard’s 2015 aquavits included in a special longship shaped carrier. 100 ml bottles each of Caraway, Citron, Dill, Licorice, Holiday Spice, and Cask Strength aquavit. Small enough to sample, big enough to share! Have an avid DIYer on your gift giving list? Sometimes picking out the right gift for the handy person in your life can be a little daunting. The solution, a gift certificate from Ballard Reuse. Ballard Reuse is a used and salvaged building materials super store and has a full range of materials, odd finds and some just plain cool stuff. Learn more HERE. West Woodland neighbor and author Molly Torres published Ash Tuesday over the summer. The story is set in 2018, and the world is being ravaged by climate changes, natural disasters and an insidious and fast moving virus. To escape, a group of loosely connected, but like minded individuals, travel to a 20 acre off-the-grid compound in Montana. Ash Tuesday is available at Ballard’s favorite independent book store, Secret Garden Books, 2214 NW Market Street, and on Amazon. NW 58th Street: Locally Made, Shop Online! Margaux Jones creates 100% original, PVC-free, vegan cuffs, purses, bracelets, and more right here in Ballard’s West Woodland neighborhood! Her mission is to create beautiful accessories that have a low impact on the planet. Shop online or at these select retailers. Alice in Stitches: Locally Owned, Shop Online! Alice in Stitches provides a full assortment of quilting, knitting and needle art supplies, as well as unique gifts like this ‘HiyaHiya Interchangeable Knitting Needle Gift Set’ available HERE. New to needle arts? Find inspiration on Alice in Stitches, as well as quilting tips and tricks. If your ready to shop, find Alice in Stitches on eBay, Etsy, and Amazon. Give the gift of massage this holiday! Sattva Healing Arts offers a wide range of services, including therapeutic massage, Reiki, private yoga instruction and more! Can’t make it to the studio for a session? No problem! Sattva Healing Arts provides mobile massage. Skip the commute and they’ll come to you! C2K Design: Locally Owned, Shop Online! Check out gift worthy pieces like the Ron Swanson Beer Koozie, distictive Hawks T-Shirt designs, Mariners mugs, and more created by local graphic artist Court Hoffman! Great gifts you’ll love to own and share with a friend. Wear this safety pin as a way to show the people in your community that you stand with and support them – no matter what. This hand-cut design is available in sterling silver, solid 14k gold or 14k gold-fill. Hang those stockings with care & fill with awesome gifts from Peace General Store. 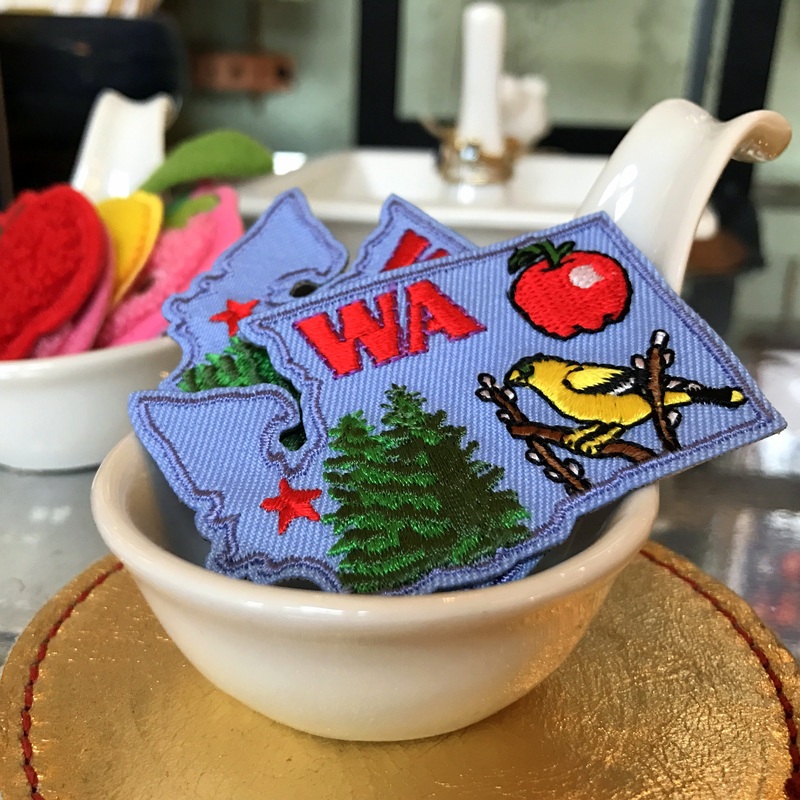 One of my favorite items is this mini-Washington State patch, perfect for your little one’s backpack. From greeting cards to guitar straps, you’re sure to find something for everyone on your list. The Bee and Bug: Handcrafted Locally! Shop Online! Nicole has a variety of holiday cards and gifts available, including cards celebrating Hanukkah, watercolor painting, prints and more. Instead of buying a sweater that will probably be returned or a scarf that might be worn once, why not gift something really memorable this year. A gift that will last a life time – a tattoo! Through December, Slave to the Needle is offering a free print for every $100 gift card purchased. Buy a gift card for your friend & you get a little something too! While supplies last. Limit 2 per person. Learn more HERE. 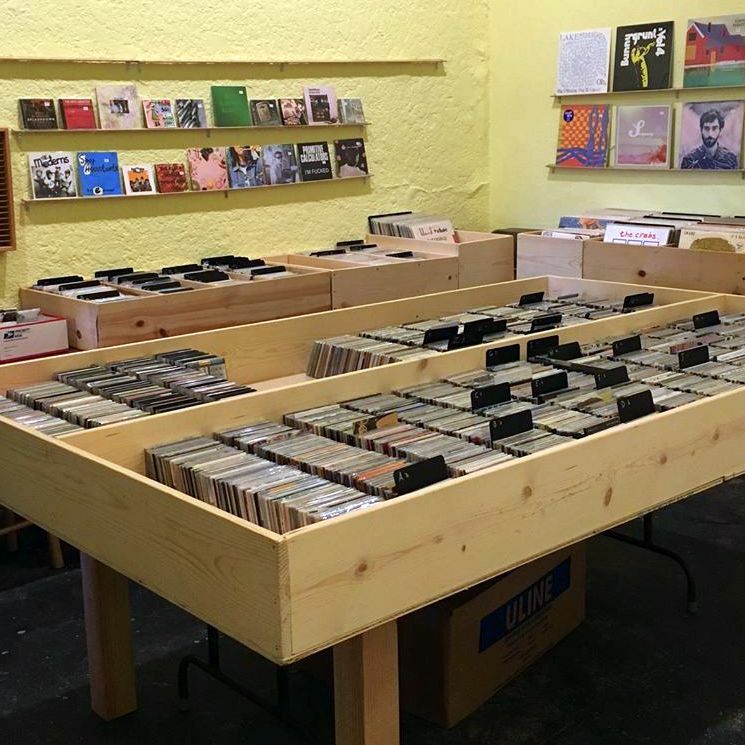 Let Jigsaw Records do the shopping for you. For $10, they will select four random new CDs for you, or the lucky person on your holiday list. If you order more than one set, Jigsaw Records will ensure no duplicates. Gift giving made simple! Visit their shop on NW 65th Street, in the Old Woodland Theater, or purchase online HERE. Looking for a delicious and nutrient rich hostess gift? Bring a jar of Classic Kraut by Firefly Kitchens. Classic Kraut is easy to slip into a berry and banana smoothie (no one will know), is delightful on a cheese board for some zip and tang, and is fantastic with brats, pork chops, or a reuben. Show your love for local this holiday season with new gear from your favorite Ballard brewery. My favorite is the Stoup Brewing flannel shown below. This plaid wool shirt, with Stoup orange accents is C-O-Z-Y! And the sleeves are fully lined for itch-free comfort. Buy two… you’re going to want to keep one for yourself. Find this shirt & more at the brewery.